New Mug of the Moment! 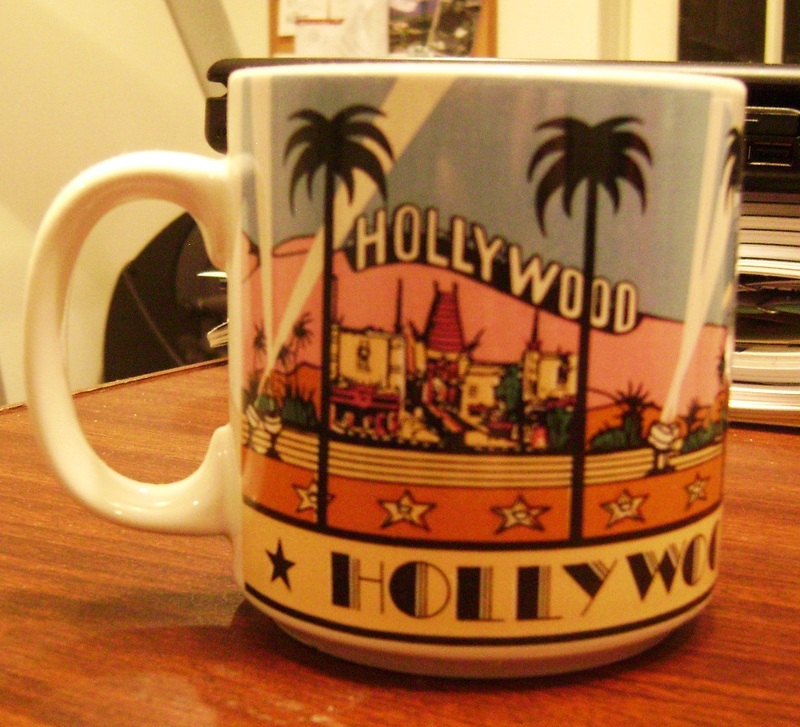 Yes, cool/cold weather has arrived here at the Three O’clock Pot (Coffee, that is) and that means time for a new mug. This one came from a too short visit to Snowshoe, WV some 20+ years ago. As you well know, coffee is good every single day but when the ‘months have ‘R’s…it is a bit better in our opinion. That said, we are in the home stretch until that happens. Until then, have another cuppa joe and enjoy the new ‘Mug of the Moment’. 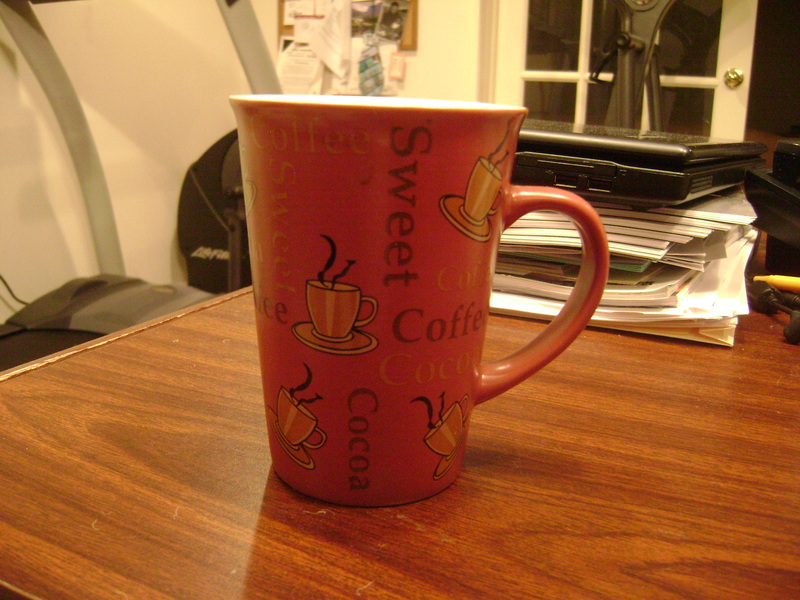 This mug was purchased at a local ‘dollar store’ on a last minute, solo camping trip…in the fall! New ‘Mug of the Moment’! I like to drink my coffee from a mug that is relevant to what is going on around me. When the weather turns warms, I like my mug to relate. 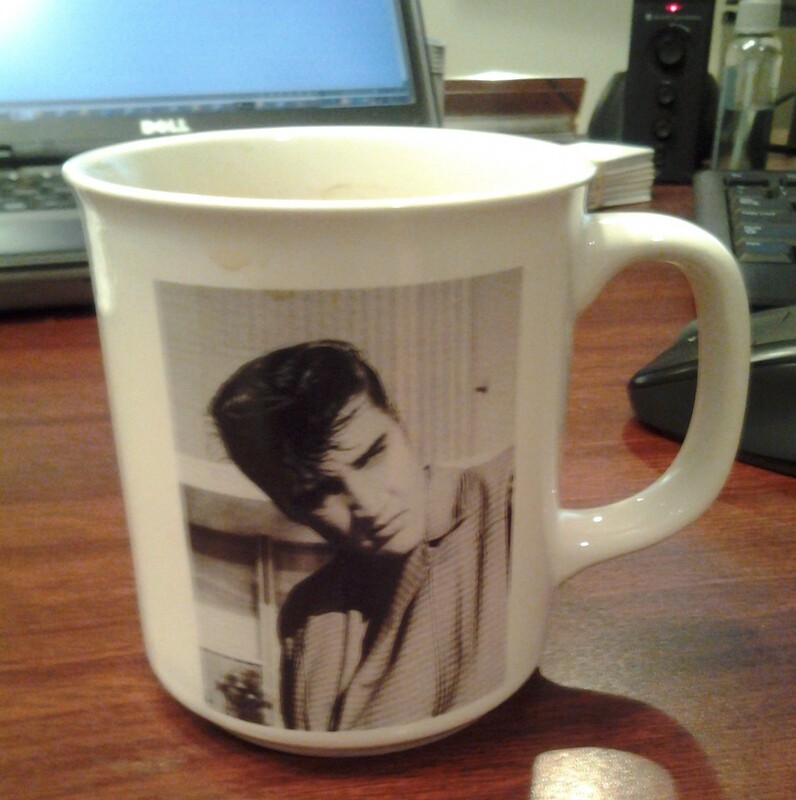 So, why am I drinking from a ‘Young Elvis’ mug here in mid June? The answer is easy…as the weather gets hotter and muggier, what is ‘cooler’ than young Elvis!? On our favorite blog about Business Development, Sales and Marketing (Building New Business – http://buildingnewbusiness.com) there is an interesting post entitled ‘I Love It When I Am Wrong’. (Click Here To Read) The post talks about lessons learned when one is proven wrong. Well, chalk up a ‘lesson learned’ for us here at ‘The Three O’clock Pot’. When the Single Cup’ brewers came out, their pricing alone as well as the pricing of the small ‘single cups’ quickly put this new technology into the ‘There Is No Way The Coffee Can Be That Good’ category. That said, for this coffee lover…I have been proven wrong. I now have one in the kitchen and one on the way for the office. 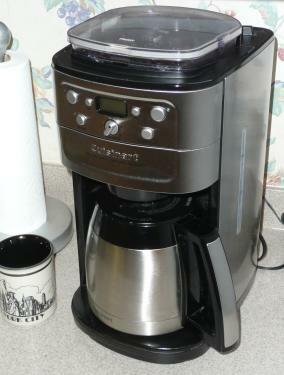 Holy cow do I love this machine and the coffee is makes! As soon as I can ink and endorsement deal, the name of the machine will remain a mystery, publicly that is. If you are curious, let me know and I will share. In the mean time, I believe I shall have another cup. Greetings fellow coffee lovers, long time/no see. We have been busy churning the wheels of commerce, trying to turn around economy! We did a little ‘Spring Cleaning’ this weekend and that afforded me an opportunity to take a few pics of my coffee mug collection. So, in the name of fun, I will post from time to time some of my mugs from my ever growing collection. Here is the mug that started it all. My former college roommate worked in the Los Angeles office so I went out for the weekend and we headed to Hollywood and did the Universal tour, which was pretty cool. At was at the gift shop that I thought, I would purchase a mug to commemorate the trip. In the same way a hot dog tastes better around a campfire, for those of us living in ‘Hotlanta’, that first cup of coffee on a ‘snow day’ is just a bit sweeter. We got snow yesterday/last night and therefore, the entire state is ‘freaking out’ and schools are closed. Nonetheless, I will still be ‘Churning The Wheels of Commerce’ with some great coffee and looking forward to sliding into ‘Chillsville’ (Literally) for the weekend. In the mean time, here is a picture of reader Kurt W’s sweet machine! 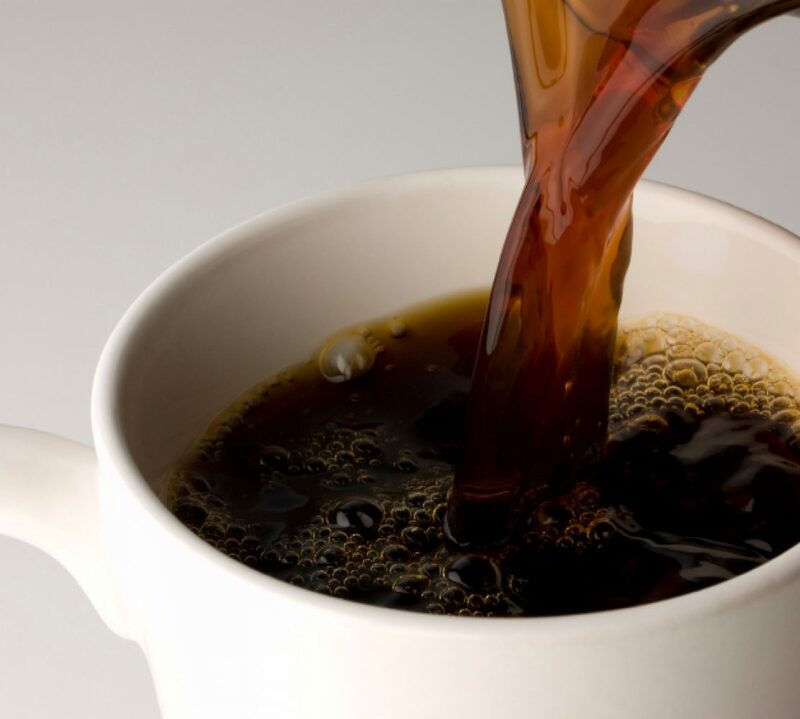 OK…I know I am quoting myself but we are experiencing some bitter cold weather here in ‘Hotlanta’ so more now than ever, are my daily cups of coffee helping me as I churn the wheels of commerce. Have a great day everyone and I will ‘see’ you and the coffee station at Three O’clock!